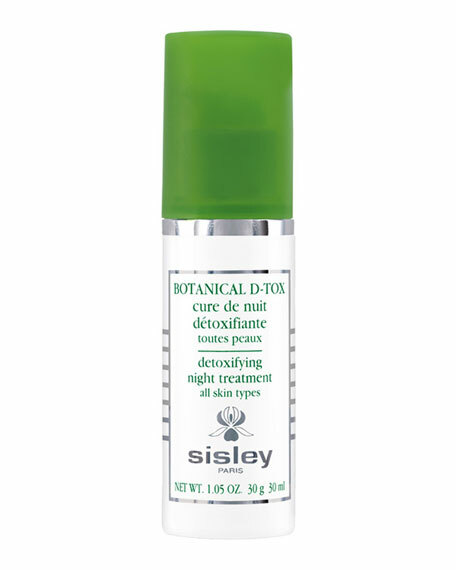 Botanical D-Tox is a month-long, detoxifying, nighttime program that works during the most favorable time to address signs of fatigue. Highly concentrated in plant extracts, it works in a comprehensive manner to focus on the skin detoxification process. Essential oils complement the product with their delicate aroma and create a feeling of relaxation when applied. At the end of the 30-day program, the complexion is visibly brightened, signs of fatigue appear reduced, the face's features appear rested, and skin is left radiant. Within the first few days, skin appears more beautifully rejuvenated. At the end of the 4-week treatment, the complexion is visibly brightened and facial features appear rested. Skin appears to have regained energy and radiance. Each night, apply two pumps to clean and dry skin, on the face, neck, and décolleté, by itself or before your usual night skin care. One bottle contains enough for two month-long programs.